The Boston-based Blue Heron Renaissance Choir has been named artist-in-residence at Boston College for the 2010-11 academic year. The choir’s repertoire emphasizes 15th-century Franco-Flemish polyphony and neglected early 16th-century English compositions. The members will work with music students and University groups such as the Boston College Madrigal Singers in classroom and rehearsal settings. On October 12, as part of a campus-wide week of lectures and concerts focused on the Renaissance, the choir held an open rehearsal in St. Mary’s Chapel, attended by some 40 students and faculty—prelude to a formal concert two days later. Among the works performed was Nicholas Ludford’s Missa Regnum mundi, which comes from the Peterhouse partbooks, a fragmentary collection of sacred music from pre-Reformation England. 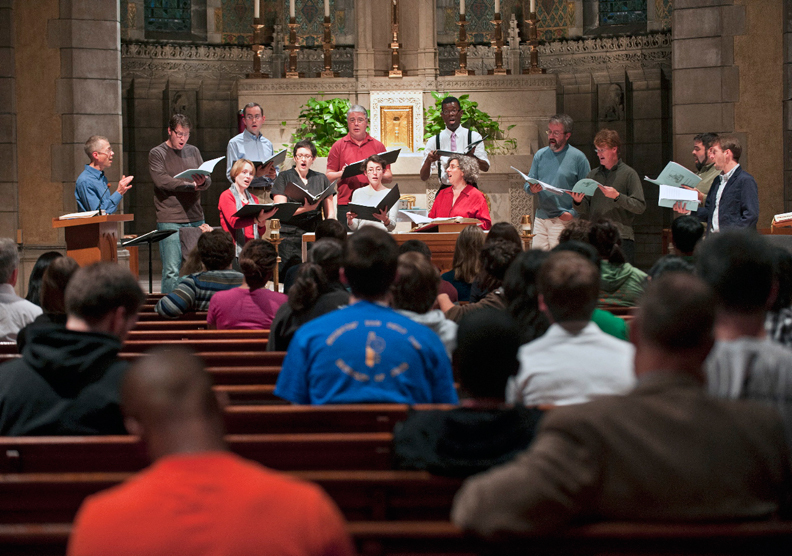 The choir’s position at Boston College is funded by the University’s Institute for the Liberal Arts, which supports interdisciplinary programs and projects. This feature was posted on Wednesday, October 13, 2010 and is filed under Featured Photo.